It was good to be a member of the Fishermen's Fellowship. They were surrounded by streams and lakes full of hungry fish. They met regularly to discuss the "call to fish," the abundance of fish, and the thrill of catching fish. They got excited about fishing! Someone suggested that they needed a philosophy of fishing, so they carefully defined and redefined fishing, and the purpose of fishing. They developed fishing strategies and tactics. Then they realized that they had been going at it backwards. They had approached fishing from the point of view of the fisherman, and not from the point of view of the fish. How do fish view the world? How does the fisherman appear to the fish? What do fish eat, and when? These are all good things to know. So they began research studies, and attended conferences on fishing. Some traveled to faraway places to study different kinds of fish with different habits. Some got doctorates in fishology. But no one had yet gone fishing. A committee was formed to send out fishermen. 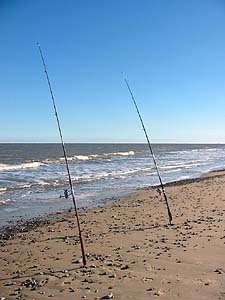 As prospective fishing places outnumbered fishermen, the committee needed to determine priorities. A priority list of fishing places was posted on bulletin boards in all of the fellowship halls. But still, no one was fishing. A survey was launched to find out why. Most did not answer the survey, but from those who did, it was discovered that some felt called to study fish, several had even earned doctorates in Fishingology, a few went into furnishing fishing equipment, and several went around encouraging the potential fishermen. One fellow developed a program called Purpose Driven Fishing, and he became world famous and wrote a book on fishing with a leader's guide and DVD of fishing principles. What with meetings, conferences, and seminars, most recipients of the survey just simply didn't have time to fish. Now, Jake was a newcomer to the Fisherman's Fellowship. After one stirring meeting of the Fellowship, he went fishing and caught a large fish. At the next meeting, he told his story and was honored for his catch. He was told that he had a special "gift of fishing." He was then scheduled to speak at all the Fellowship chapters and tell how he did it. With all the speaking invitations and his election to the board of directors of the Fisherman's Fellowship, Jake no longer had time to go fishing. But soon he began to feel restless and empty. He longed to feel the tug on the line once again. So he cut the speaking, he resigned from the board, and he said to a friend, "Let's go fishing." They did, just the two of them, and they caught fish. The members of the Fisherman's Fellowship were many, the fish were plentiful, but the fishermen were few! DOES THIS SOUND LIKE YOUR PASTOR?